University of California Press, 9780520076709, 253pp. 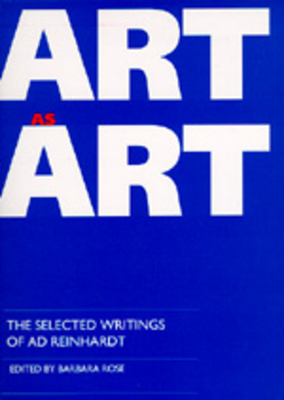 Ad Reinhardt is probably best known for his black paintings, which aroused as much controversy as admiration in the American art world when they were first exhibited in the 1950s. Although his ideas about art and life were often at odds with those of his contemporaries, they prefigured the ascendance of minimalism. Reinhardt's interest in the Orient and in religion, his strong convictions about the value of abstraction, and his disgust with the commercialism of the art world are as fresh and valid today as they were when he first expressed them. Barbara Rose is the author of books on Joan Miro, Claes Oldenburg, Lee Krasner, and Ellsworth Kelly and has twice received the College Art Association's Mather Award for distinguished criticism.